recall that the Government of the United Republic of Tanzania had committed to applying the Cyber Crimes Act of 2015 in a manner that respects fundamental freedoms and to addressing a potentially negative interpretation of the law. However, the first cases of application raise concern in view of their potential infringement of fundamental freedoms. The Heads of Mission are concerned about the recent arrest of members of staff of the Legal and Human Rights Centre and confiscation of key technical outfits, reportedly motivated by Section 16 of the Cyber Crimes Act. The events took place while the organization was compiling observations made by national election observers around the country, a task for which the Legal and Human Rights Centre has been accredited by the National Electoral Commission. The Heads of Mission recall that the Legal and Human Rights Centre is a member of the Tanzania Coalition of Human Rights Defenders. As spelt out in the African Charter on Democracy, Elections and Governance, the Heads of Mission are “convinced of the need to enhance the election observation missions in the role they play, particularly as they are an important contributory factor to ensuring the regularity, transparency and credibility of elections”. 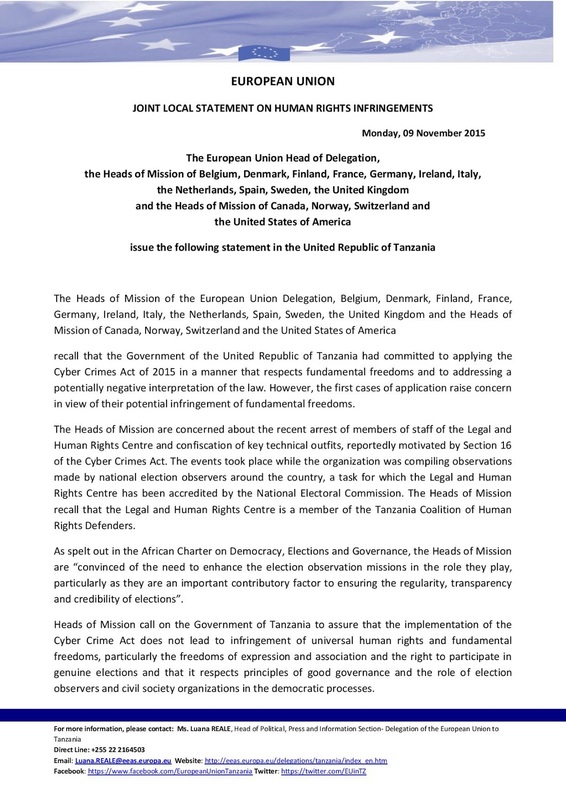 Heads of Mission call on the Government of Tanzania to assure that the implementation of the Cyber Crime Act does not lead to infringement of universal human rights and fundamental freedoms, particularly the freedoms of expression and association and the right to participate in genuine elections and that it respects principles of good governance and the role of election observers and civil society organizations in the democratic processes.